The most famous line from The Man Who Shot Liberty Valance (John Ford 1962) is undoubtedly "This is the West sir. When the legend becomes fact, print the legend." It has gotten a life of its own, popping up on a number of different occasions. But there is another line, also spoken in the first few minutes of the film, which to me is of equal importance. 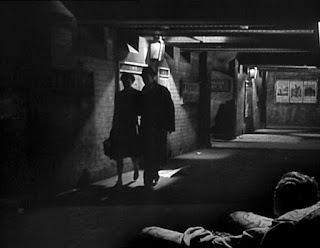 The film begins with a US senator and his wife arriving with train to the (fictional) town called Shinbone, where they once lived, many years ago. As she goes on a tour of the place with an old friend, the former marshal, she says "The place sure has changed. Churches, high schools, shops." The marshal replies "Well, the railroad done that." I have earlier written about trains and their importance for films and for society at large, the blood stream of modernity (here and here), and Liberty Valance is one of the films which directly deals with this. The railroad changes everything. In a later scene the senator says to a couple of reporters that they are young, they do not remember the old days before the railroad. It is a reminder that John Ford's breakthrough was The Iron Horse (1924), a film about the building of the transcontinental railroad, from California to Iowa (where it connected with the railroad to the east coast). Both these films are also a reminder that one of Ford's main thematic concerns has always been the history of the United States. Some have called Ford the Shakespeare of the US, and he has also been compared to Balzac, but there is another Frenchman that could be invoked. Alexis de Tocqueville. The Man Who Shot Liberty Valance is told in one long flashback, with the senator, Ranse Stoddard (James Stewart), explaining to the reporters why he has come back to Shinbone after so many years. He and his wife, Hallie (Vera Miles) have come because an old friend has died, Tom Doniphon (John Wayne). But the story is not just one of these three people, it is also about democracy in America, hence the relevance of mentioning Tocqueville, and his major study of the US, Democracy in America (De la démocratie en Amérique) published in two parts 1835 and 1840. His analysis of, for example, the grassroot democracy in small towns, such as Shinbone; the habit of having elections for all positions (although de Tocqueville disapproves of having judges elected); his talk of "self-interest well understood" as the bedrock of American society; his emphasis on the importance of justice, including as a check on democracy itself. These are things which Liberty Valance and other films by Ford address. Combining Ford and Tocqueville has been done before (see for example Robert Pippin's essay "Tocqueville, the Problem of Equality, and John Ford's Stagecoach") but I wonder if not more can be done here. Most of Ford's films that are set in the past, at least those set in the American past, could be studied in tandem with Democracy in America. The fact that Ford's depiction of that past changed over time might make such a comparative study even more interesting. Hallie, Pompey and in the back the Ericsons. John Wayne's character Tom Doniphon is similar to Ethan Edwards, Wayne's character in Ford's earlier The Searchers (1956). They are both interstices between the past, which they represent, and the future, which they help bring about but are unable to join. They are also in-between violence and peace. Liberty Valance (played by Lee Marvin) is the villain in this film, but there is not a neat line between him and the rest of town, it is a grey area. Doniphon is right in the middle. He is not psychotic and homicidal like Ethan Edwards, instead he descends into self-pity and resentment, but they still have the same role in society. 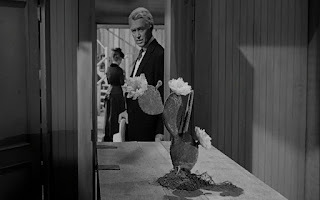 Liberty Valance is an ambivalent villain because, while he is often referred to as pure evil, he is insecure and bitter too. It sometimes seems as if he is violent and arrogant as a reaction against the town's hatred towards him. Sometimes he looks at Doniphon and Stoddard with a puzzled expression, sometimes with envy, sometimes with resentment. In the end, when he is shot, the doctor contemptuously rolls him over and says "He's dead." after which he is thrown on a wagon and driven out of town, his legs hanging down and the boots almost dragging in the sand. It is like as if the minute he is killed, he is forgotten. I also said that Doniphon died alone and forgotten, but that is not quite true. 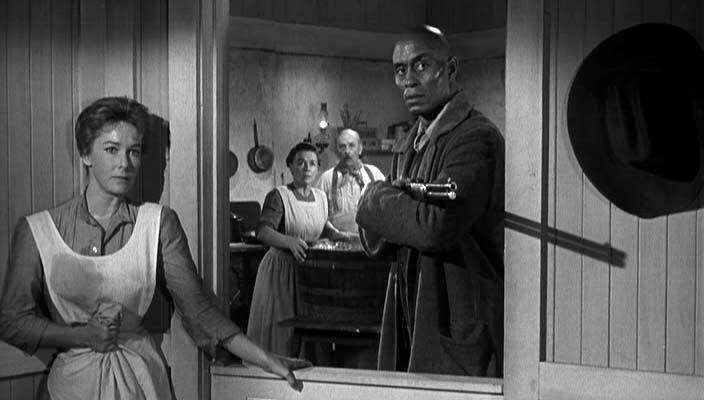 His friend Pompey (Woody Strode) was with him until the end. Their friendship was of the "close personal" kind that might be given a queer reading, although it is not necessary. But Pompey is an important character, and there are a few pointed scenes with him, based around the fact that he is a black man. In one scene he is reciting the Declaration of Independence, standing beside a photograph of Abraham Lincoln, but is unable to remember the words "that all men are created equal". Perhaps he was unable to say them because he had never been treated as an equal. In a later scene, when he is denied service in a saloon, the audience is reminded of this. The joy, hope and aspirations of the church building scene in Ford's My Darling Clementine (1946) are nowhere to be seen in The Man Who Shot Liberty Valance, but it would be a mistake to see this is a sudden change in Ford's outlook. His films have rarely been cheerful and optimistic. There is great beauty in them, and sometimes love and kindness triumphs, but there is frequent darkness, tragedy, a mourning of something that has gone missing but was probably never there in the first place. In How Green Was My Valley (1941) the grown man remembers his childhood with affection and longing, yet that childhood is presented as being filled with poverty, death, prejudice and oppression. 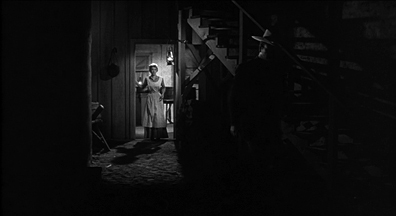 There is usually a double view of the past in Ford's films, and so it is in The Man Who Shot Liberty Valance. "The place sure has changed. Churches, high schools, shops." Hallie said, and the marshal replied "Well, the railroad done that." Then he added, wistfully, "The desert's still the same." This post does not walk alone, it has a partner. 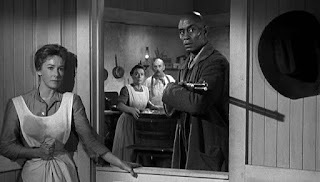 My friend and former guest blogger Sofia Åkerberg has also written about The Man Who Shot Liberty Valance for today. Read her here. The Iron Horse is not a great film, and maybe it would have been better if Raoul Walsh had directed it. But it is not a bad film either. There is especially a scene on a train filled with wounded men and women, among them an old man who is weeping inconsolably next to his dead friend, which is heartbreaking. 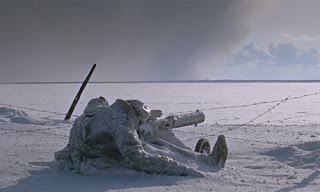 Three earlier post by me about Ford are here: The Grapes of Wrath, Tobacco Road, The Searchers. 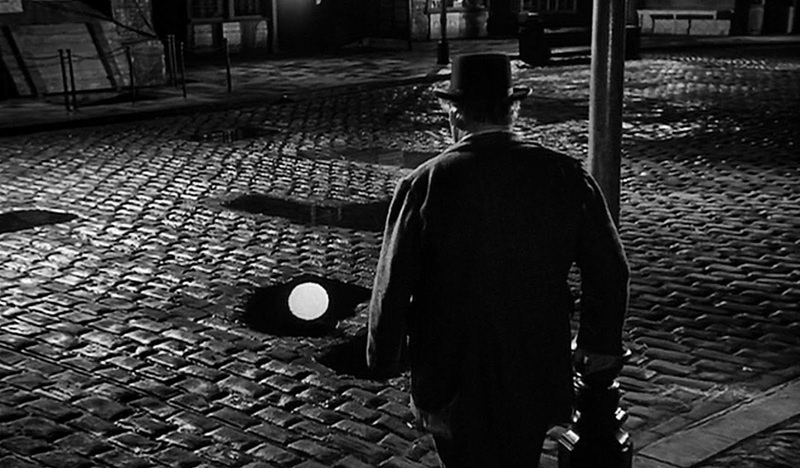 Last weekend Adrian Martin initiated a spirited discussion about David Lean, and there were some requests that I should write about Lean here on my blog. I have been reluctant to write about Lean, even though he is second only to Hawks in my own pantheon of filmmakers, because I have felt that a blog post is much too short. That is still the case and I shall write a proper 6000 word-ish essay, but still, a post there will be. Consider it a preview of coming attractions. It is also off-schedule as you may have noticed, but next Friday the usual schedule will return (0900 CET every second Friday). 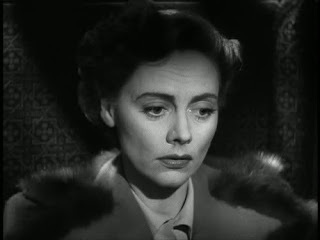 In Brief Encounter (1945), the main character Laura Jessop (Celia Johnson) is sitting on a train and looks out through the window, watching the dark landscape passing by. As she does so she suddenly imagines herself in glamorous surroundings, her mind taking her far away from the dreary ordinariness of her life and the space in which she lives, and she sees dreamlike images of these other spaces in which she would rather be. This is what makes her a quintessential Lean character, this desire to get away, to unleash oneself from England (or one's home space) and to follow the dreams and the hidden passions. This is what Laura wants, this is what Pip wants, this is what Madeleine wants, this is what Jane Hudson wants, this is what T.E. Lawrence wants, this is what Ms. Quested wants, and, of course, this is what Lean himself wanted. And what he did. Most of them act on their desires to strike out. But it is not easy. On the one hand they have little control over their feelings, the bewildering passions that consumed them, and on the other hand they have no control over space. In Lean's films space is destiny, the environment in which you found yourself has an incredible power over you, it changes you and it decides your outcome. There is an pantheistic touch to Lean's films, right from the start with In Which We Serve (1942); the trees, the moon, the canals, the desert, the jungle, the cliffs, even a train station, it all has some kind of force, some spirit in them which makes them come alive, to speak to the humans who are privileged enough to have the gift of communication. Communication on a spiritual level. Mrs Moore in A Passage to India might be the one who is most sensitive to this. Sometimes people just seem to disappear into the space in which they find themselves. In The Sound Barrier (1952) they literally do, the air planes barely visible high up among the clouds; a film sprung from Lean's love of those very air planes. In it Susan Garthwaite tries to explain her feelings of flying, why she loves it so much, and she says it is like being in a dream. Lean communicated this aspect of the world, or his view of the world, by sound and vision. He was not one for dialogue (even though they talk a lot in the three films scripted by Noel Coward) and there are large parts of his films when nothing is said at all, because it is not necessary and in any case our language is not equipped with a vocabulary capable of speaking about these things, about the wind, and the flowers and the sunbeams streaking through the forest. The shadows of birds over the jungle foliage in The Bridge on the River Kwai (1957). There is great beauty to be found in Lean's films, a constant sense of awe and wonder, which is almost unparalleled in world cinema. This world is presented subjectively, Lean's films are frequently shot from an individual's subjective perspective even though this is not emphasised. Both the images and the sound can be subjective, unreal but this subjective experience is presented as if it was an objective record of the world, so the audience has to infer for themselves what is real and what is not. Pip's run to the graveyard with stolen food is an obvious example, or when Howard Justin walks up to his wife's room, having found out about her unfaithfulness (in The Passionate Friends, 1949), or when Henry Hobson is hallucinating, but in other films it is less obvious that the space has been distorted or that people behave in slightly odd ways. There is also a kind of technical beauty. Lean was a master of all aspects of the filmmaking process; camera movement, editing, lighting, staging, colours and so on. It is rare for a filmmaker to have this maddening sense of control and power. (To take one example, Hawks is a much better filmmaker in general than Robert Wise but Wise's films are much better edited than Hawks's.) It is not just nature that is breathtaking but Lean's skills as well. 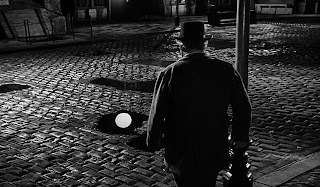 Sometimes this has made critics somewhat concerned, like Dilys Powell on Oliver Twist (1948). "This is an extraordinarily careful film; careful in construction, timing, cutting, movement, lighting, and details of gesture and dress." Things hardly end well for his characters; their passions usually get the better of them, they are not as careful or controlled as Lean. Even in Bridge on the River Kwai, which is sometimes referred to as a Boy's Own adventure but is rather a study of pride, obsession and folly, in which everybody dies in the end. It does not always end as bad as that but the characters often end up miserable or at least disappointed, even though for a while they managed to live more fully than they had ever done before. The overwhelmed main characters, strangers as they are, are also often at odds with those with more experience, those who have inhabited this space much longer. 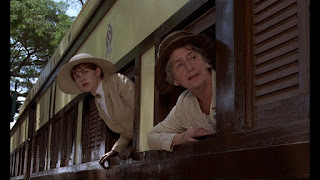 Jane Hudson is criticised by the Italians she meets for her romantic, unrealistic idea of Venice, much like Lawrence is criticised for his romantic and idealistic view of the desert. There is a certain madness to them, and Lean shared this madness. "I'm I mad? Can I make the audience share my thrill? I know I'm a sort of maniac." he wrote when making Lawrence of Arabia. In River Kwai the doctor in the prison camp frequently shakes his head in disbelief, and at one point says, about the British and the Japanese commanders, "Are they both mad, or is it me? Or is it the sun?" The truth is that they have been transformed by the space into which they have been dropped, and consumed by it. In Hawks's films the characters create their own space, in Lean's films space create the characters. "You don't have to scratch very deep in any human being to get down to the animal. We pretend we don't but we do. It's very, very little way below the surface, the wild and darker side of our nature." Lean said at one point, and he has illustrated this point over and over again. And Lawrence of Arabia (1962) is the one film of his in which he pushes all of his themes and his style to the outmost extreme; it is a film like no other. To again quote Powell: "I think it is the first time for the cinema to communicate ecstasy." To get back to Brief Encounter, Laura is sitting in her living room, remembering her love affair and when the flashbacks appear they do so in a double exposure, so that we see Laura sitting there while the past is shown in front of her, as on a screen, as if her own past was a film she was watching at the cinema, the cinema to which she went once a week. Not even to Laura herself is her experience real, but like a mirage or a hallucination, much like Lean's oeuvre as a whole. The quotes come from Gerald Pratley's The Cinema of David Lean, Kevin Brownlow's David Lean: A Biography and The Dilys Powell Film Reader. Next is her appearance as a figure of Tom Miller's feverish imagination in Frank Tashlin's outrageous and magnificent The Girl Can't Help It (1956). She plays herself, and Tom Ewell plays Tom Miller. She has a fine voice. 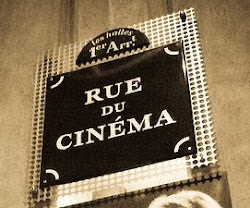 In The Young Girls of Rochefort (Jacques Demy 1967), a young man is looking all over town for the woman of his dreams. In one scene he is in a café when she approaches it, and it would seem that they will finally meet. But as she walks in through one door he walks out through another door. Once when I saw the film in a cinema somebody in the audience could be heard screaming "No!" when faced with the agonising fact that they were so close yet missed each other yet again. Such moments, when our emotional investment with the characters becomes so strong that we cannot control ourselves, is one of the most gratifying things with art, or storytelling. I am not talking about being afraid that a character might be eaten alive by a velociraptor, I am talking about shared feelings of pain, sadness or joy. This is not a necessary requirement for great films, there are many aspects of a film and this is but one of them, but it is an unusually profound one. Some filmmakers are better at creating such feelings than others. 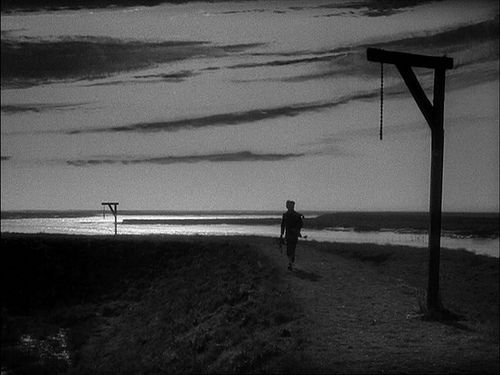 Three that I personally think are particularly good at this is William Wyler, Ingmar Bergman and Mikio Naruse; often when watching their films I need to restrain myself for not attacking the screen because my reaction to what happens is so strong. These Three (Wyler 1936), The Heiress (Wyler 1949), Mother (Naruse 1952), Yearning (Naruse 1964), Sawdust and Tinsel (Bergman 1953) and Scenes From a Marriage (Bergman 1976) are some examples of this. 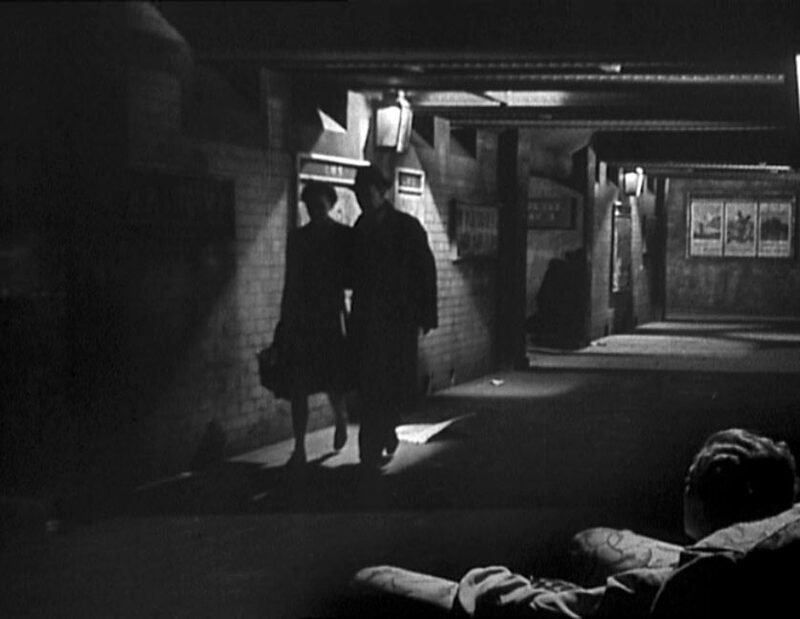 An exceptional film is David Lean's version of Brief Encounter (1945), which I have written about before. But nothing has had the same impact on me as the episode of The West Wing when C.J. Cregg's partner Simon Donovan is killed. I do not really know why, but probably because, as a TV-series, I had been with these people for so long, and I was so absorbed in them and their lives (with "them" I mean all the characters in the series, not just C.J. and Simon). It is also the way it was written (Aaron Sorkin) and directed (Alex Graves) of course, from the sudden shock to the impressionistic aftermath, and the music (Jeff Buckley). I said sudden shock, which it was, but it was not out of the blue. I felt rather certain that it would come, and, well, I could barely watch it, I was like a little kid watching some scary film for grown-ups. It is now several years since I saw it for the first time, but I remember it in detail and my reaction to it, and what I was doing and how I was feeling. I was watching it on DVD and I paused it, then continued to watch, and then went back and watched it again. It is frequently said that a whole generation of children was traumatised by the death of Bambi's mother (in 1942). This was my such moment, and I was not even a child but a grown man.